Everyone needs a roof over their head, making roofing arguably the most important part of your home. Your roof protects you from the elements while helping to maintain a comfortable temperature in your home and maximizing energy efficiency. Many old homes were built with outdated materials and techniques, making them no longer able to offer reliable protection and save energy. A leaking roof can cost you far more than a repair – it can damage walls, ceilings, flooring, insulation, property, and even pose a fire hazard in some instances. Old and wet insulation ceases to work properly, and can cost you hundreds or thousands of dollars annually in heating and cooling costs. Roofing may not be glamorous, but it’s often a necessity that can reap rewards, or even pay for itself over the years. Modern roofing techniques offer reliable protection that lasts far longer than anything imagined 50 years ago, so it makes sense to work with an Olympia roofing contractor with experience working in our region. Mike Winter Olympia Contractor can help you get a handle on your roofing situation. We understand that it’s often necessary to balance the demands of roofing construction against your own budgetary limitations, so we will work with you to design a roofing plan that addresses all of the various factors. If all is working properly, you seldom even realize your roof exists. However, when you encounter a leak coming through the ceiling, you suddenly become acutely aware of just how important your roof is. While repairs are often possible, and preferable, to a complete roofing job, there comes a point where repairs will no longer suffice. Unfortunately, some leaks manifest themselves only after they’ve become a serious problem. In older roofs, water can leak for some time before it’s ever noticed. Water may accumulate above the membrane of a flat roof, or saturate insulation before a sudden failure causes major damage. Leaks may also travel along roof support beams, so the place you see the leak may not be indicative of where the roof failure occurred. Others issues like ice dams or broken gutters can necessitate a roofing job well before the lifespan of the existing roof has expired, and this is why the quality of your roofing contractor matters. We go the extra mile to not only ensure your Olympia roofing job is done right, but also concentrate on the final touches, like gutters and waterproofing, to ensure the lifespan of your roof. How much will roofing job cost? This is impossible to answer until we get a look at the scope of the project and find out what materials and style of roof you prefer. Many people are unaware of many of the modern roofing designs that work best in Olympia, but we can help you narrow down your choices based on your location and the nature of your home design. We also understand that a roofing job is never convenient, so we will work diligently to ensure that you are put out as little possible. By staying on task, and within your budget, you will quickly get back into your normal routine while saving energy costs with your new roof. We are eager to start working with you to work out the details of your roofing job. What follows are some basics that can help you better understand some of the options we may offer. PVC and TPO Membrane Roofing – For the layman, it’s difficult to tell these two roofing styles apart.These are two of the hardest flat roof systems available today, and while installation is very similar, the two products couldn’t be more different. While the debate rages on for which is the best, the truth is that each roofing options has its own advantages and disadvantages. If you have a structure with a flat roof, we can help you decide which would work best based on a number of factors. 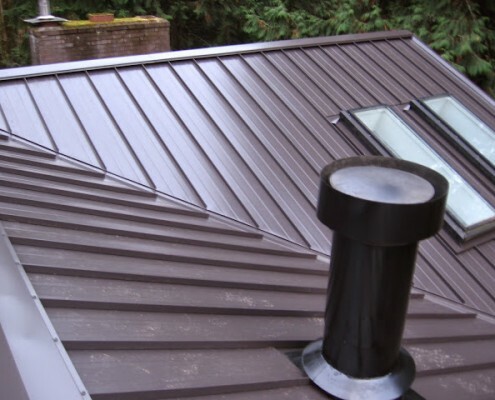 Lifetime Metal Roofing – If you want a permanent roofing structure, metal roofs cannot be beat. Our rainy Olympia climate also makes metal roofs very appealing for people that enjoy the sound of raindrops tapping the surface of the roof. Green Roofs – Green roofs are growing in popularity because they not only offer a garden landscape on the roof of any building, but remove heat from the air through evapotranspiration, lowering the heat on the roof and throughout the building. Built Up Insulation – Built up roofing options offer great waterproofing, UV protection, and low maintenance, but installation can be slower and expensive. Drainage Management – The lifespan of your Olympia roof requires that special attention be paid to drainage management. Poor drainage can not only damage your roof, it can cause damage to areas around the foundation where water accumulates. Lifetime Warranties – Any contractor that truly understands roofing in Olympia should offer a warranty on their workmanship. Waterproofing – This is necessary on many roofing jobs where an overhanging deck or patio covers an area below. Class A Fire Ratings – By using materials and methods on Olympia roofing jobs that reduce flame spread or surface burning, we create roofs with the highest fire ratings possible. Contact us today to schedule an appointment. If it’s an emergency, we will make your roofing job our Number One priority. At Mike Winter General Contractor we are dedicated to quality roofing workmanship on all Olympia homes and businesses. We are eager to put our expertise to work to complete your roofing job on time and with as little hassle to you as possible.